Circling the Bay in 30 Days – On foot and on transit – Peninsula Moves! 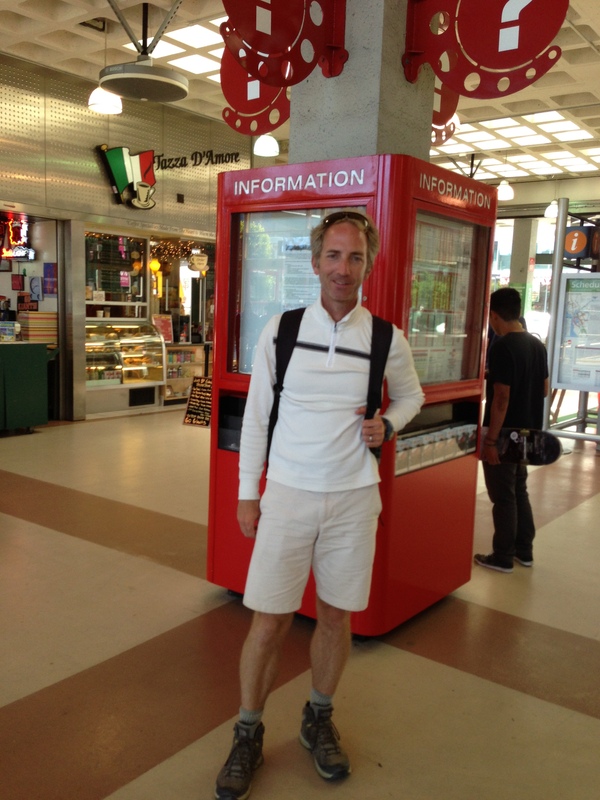 Schwabe wrapping up his day of hiking at San Francsico’s Caltrain Station. Former triathlete Kurt Schwabe has taken on a new challenge – he is walking the 300-mile long Bay Trail in 30 days, and – to up the ante – he’s taking public transportation to every trail head. Schwabe is a confirmed walker who lives in San Francisco and takes Oscar, his little fluff ball of a dog, on regular walks in the City. He also is a long-time public transit fan, having met his wife on Muni’s 30 Stockton bus. The two interests were a perfect fit for his latest adventure. “The Bay Trail is connected to public transportation at just about any point along the Bay,” said Schwabe. By the time he is done, he will have ridden on 11 different transit systems, all with one Clipper card. He began his journey on May 30, with a media kick-off event at Crissy Field in San Francisco and got started in earnest the next day in the North Bay. By the time he reached SamTrans and Caltrain territory this week, he was ¾ of the way through his journey. June 25, Schwabe took Caltrain to the Burlingame station and then walked to the Coyote Point Recreation Area. After a detour to CuriOdyssey, a children’s science center located in the park, he walked on to the San Bruno Caltrain Station, only to discover that he had missed his train. Another two miles on the Bay Trail took him to a SamTrans bus stop, where he was able to board Route 292 for the trip back home to San Francisco. “Fortunately, I didn’t have to search for two dollars or ask a stranger to break a five – I just scanned my Clipper card and sat back for the ride,” Schwabe blogged. Already in good shape, Schwabe is averaging 10 miles a day and has logged a few days that were as long as 20 miles. “I am doing better than I thought I would,” said Schwabe, who has only one blister. Although he has enjoyed decadent treats such as a Hagen Dazs bar in Alviso, and a hamburger and a strawberry shake at the Sky Kitchen Café at the San Carlos Airport, homemade energy bars have been the main stay of his trekker diet. The recipe is posted on his blog, http://walkingthebaytrail.com, which he updates every evening. Before beginning the walk, Schwabe was not familiar with the Bay Trail. The trail walk has given him quite the education, taking him to parts of the Bay Area he has never visited before. “Coyote Hills was a surprise to me. It has a little bit of everything, hills, trees and Alameda Creek,” said Schwabe. “It feels remote but it is just a short distance from an urban area.” He also has cataloged an impressive list of wildlife sightings along the way, spotting everything from a coyote and a group of feral cats to a long list of native birds. Taking public transportation to the trail has been easier than he expected. Although Schwabe starts early, he has been home before 4 p.m. every day. The only area not served by public transportation is the San Pablo Bay Wildlife Refuge, which is bisected by Highway 37 in the North Bay. An experienced photographer, Schwabe has been recording his journey in hundreds of photographs. In the evenings he selects the best one of the day to post on his blog, along with a written account of what he has seen that day. His blog also includes maps of each segment of his trip, and instructions on taking public transportation to the trail. Visitors to the blog can click on the “flying Heron” button to track his progress in real time. If you would like to discover the Bay Trail in your neighborhood, or venture further afield, the San Francisco Bay Trail has a set of 25 map cards designed to fit into a back pack. You can also plan your trip with a self-customized map feature available for computers or smart phones. Whether you are a long-time local or a first-time tourist, there is a ride, stroll or hike for everyone.